Leopard geckos are a joy to keep. They are low maintenance, have a great personality, and have a wonderful array of colors, patterns and morphs. 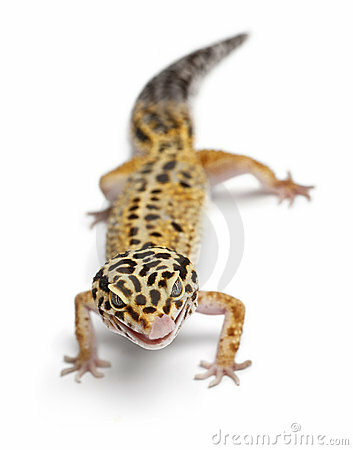 Average age for male Leopard Geckos is around 12-18 years, Females around 10-14 Years. Both males and females have been known to reach 20 years, and reports of males up to 27 years old have surfaced. Females who have been used in breeding tend to have a shorter lifespan of around 8-10 years. Basking temps: Between 87-90 degrees. Cool end 74-78 degrees. Humidity: Only high in the moist hide. Night-time temps: Between 68-74 degrees. A 20 gallon long tank is recommended. Bigger is better when it comes to enclosures. You want a nice heat gradient with a hot end and a cool end. A shallow water dish and a calcium lick. ( A small bowl filled with calcium without D3.) ZooMed repti-calcium w/o D3 is recommended. Under tank heater – (UTH): They like belly heat, use an undertank heater that covers roughly 1/3rd to 1/2 of the enclosure. The undertank heater should be controlled by a thermostat or a dimmer switch, because they have been known to reach temps. hot enough to burn reptiles if not controlled in some way. Moist Hide: A clean margarine dish can be used (2 lb. 13 oz tub) for an adult gecko. Use a smaller tub for a young leo. You can also use a old Tupperware, or glad ware container. Turn it upside down and cut a hole out big enough for your leopard gecko to climb into. The lid is the bottom. Use a hot glue gun if you want to decorate it with fake leaves. Use terrarium moss (spagnum moss) soak it, wring it out and place it in the moist hide. Keep it available at all times. Replace moss when needed. You can also use shredded wet paper towels. Provide two hides one hot hide over the UTH and one on the cool end of the enclosure. Most Leopard geckos don’t require UVB rays. Provide a ambient daytime light on a 12 hour timer. A 25 watt light bulb with my UTH set on a timer can be used. My home never reaches below 60 degrees at night. Substrates: Paper towels, butcher paper, tile, linoleum are good substrates. No particulate substrates are recommended! The risk of impaction is too horrible a death to risk. Sand is just horrible. Don’t listen to the pet stores. Provide a varied diet. Crickets, meal worms, Super worms, phoenix worms, hornworms, and dubia roaches. Wax worms only as a treat. Never feed insects from outdoors, they may have pesticides/poisons that could kill your gecko. For example, Hornworms raised by a breeder are perfectly fine for your Leopard gecko, because of the diet that they feed. A horn worm found in your garden eating the tomato plants are deadly poisonous! Gut Loading: It means the beneficial diet the insects eat transfers to your Leopard gecko. You can keep the meal worms in dried oatmeal with potatoes, parsnips, carrots whatever extra stuff that you may have in the kitchen. Let the worms eat the mixture for at least 24 hours before you feed your Leopard gecko. Supplements: Dust the insects with 2 different supplements. One feeding dust with calcium w/o D3. Next feeding dust with Herptivite multivitamins mixed at a 1:1 ratio with a Calcium W/D3 supplement. They can be picky eaters just keep trying. Young Leopard geckos (under a year) eat everyday or every other day. Adult Leopard geckos don’t eat as much. Every Leopard gecko is different and some can get over weight. Leopard geckos eat their shed. I usually see mine under a hide ripping the skin off, by biting it off. After the shed is done, it is a good idea to check to make sure it’s all off. If you have a stuck shed, use a Q-tip dipped in mineral oil and gently rub off. You could also soak the Leopard gecko in luke warm water just a half inch in depth. Do not leave the Leopard gecko unattended they will drown. They can’t swim. You could try a gentle warm mist but if they have access to a moist hide that shouldn’t be a problem. Start by resting your hand in the cage, letting the Leopard gecko smell you and get used to you. No sudden movements. After that pick up the Leopard gecko gently and place it onto the other hand. They are usually very curious. Remember the bite is hardly felt, they can’t really do any damage. They like to think they can climb, but are awful at it. They can fall and break a bone, so be careful not to have anything too tall in the enclosure. Always take care when the Leopard gecko is out. Shy Leopard geckos: If your Leopard gecko is very shy and scares easily-cover three sides of the tank with construction paper. It helps reduce stress. They will take a few weeks to get used to the new surroundings. They can become territorial, watch out for aggression. Even between females. Don’t house 2 males together, they will fight, especially when they become mature.